Is there a more fun dessert than ice cream? What about the joys of being a kid and trying a few new flavors? Yes, I might be the person who likes to have a taste or several tastes of different flavors before I make my final decision. 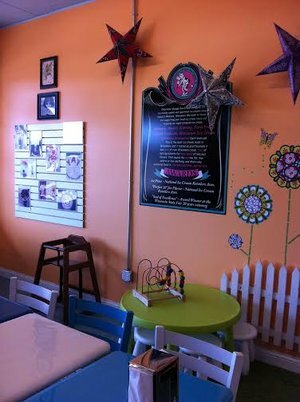 Wyliepalooza Ice Cream Emporium is a delightful ice cream shop with a bit of whimsy. It&apos;s bright and colorful inside, and there&apos;s even a working pinball machine. If you haven&apos;t visited their Brownsburg store, you&apos;ve got to visit, but before you go, here are 10 insider tips. Many thanks to Patricia, one of Wyliepalooza&apos;s owners, for her help in compiling these tips. Incredible Ice Cream: The ice cream rules at Wyliepalooza with fun flavors and names like Blueberry Cheesecake, Fat Elvis, Heaps of Love, New York Cherry and Superman. And, their sundaes have great names like Hot Mess, and a s&apos;mores sundae named King Elvis (I&apos;m an Elvis fan). Need something sugar-free? There is generally a sugar-free flavor in stock. Wylie & Co.: Who&apos;s Wylie? She&apos;s the adorable daughter of owner Cassie and the granddaugher of owner Patricia and inspiration for the store. Who doesn&apos;t love and want to support a family owned and operated business? Location: Wyliepalooza&apos;s Brownsburg location at 1022 E. Main St. doesn&apos;t get any better. It&apos;s easy to find and there&apos;s plenty of parking. There are also two other locations in the Indianapolis area (Irvington and Fishers). I&apos;ve visited Wyliepalooza after a bit of shopping at Finer Things, which is located in the same shopping plaza. Most Popular Flavor: Patricia says without a doubt that Zanzibar is the most popular flavor at Wyliepalooza. Zanzibar is a rich dark chocolate ice cream and an award winner. It won the World Dairy Expo&apos;s award for best dark chocolate. I&apos;ve tried Zanzibar, and I can attest that it deserves many awards; it&apos;s fantastic. If you&apos;re a chocoholic, this is the flavor for you. Wyliepalooza on Wheels: It&apos;s the Wylie Truck! It&apos;s a retro truck ready to serve up ice cream and treats at your next event. The truck is stocked with a dozen ice cream flavors and they serve hot fudge sundaes and Bubble Tea (a delicious Tawainese specialty drink, served cold with tea, milk and tapioca pearls). Wylie Truck is perfect for weddings (instead of cake serve ice cream and ice cream treats) and other events. Specials: Keep up with new flavors and specials by following along on Wyliepalooza&apos;s Facebook page and Twitter account. More Than Ice Cream: Wyliepalooza sells ice cream cakes, Halo-halo (a beloved Filipino dessert, made with shaved ice, milk and fruits), Bubble Tea and savory foods like hot dogs, chips and other snacks. Party: Need a place to have a party for a small group of children? Wyliepalooza can accomodate parties up to 10 children (Monday-Friday, lunchtime to afternoon). Contact the store to make arrangements. Emporium: Wyliepalooza sells all sorts of fun gifts for kids, like pinwheels, crowns and other small toys kids love. They&apos;re inexpensively priced at a few dollars. The Emporium (shop) is a fun place to sit down and enjoy ice cream, chat with the owner and employees or even take a turn playing pinball. 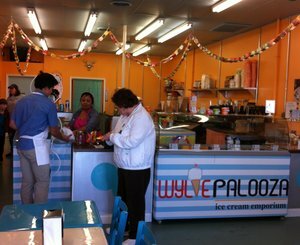 Open Daily: Wyliepalooza is open 7 days a week to help serve all of your ice cream needs and cravings. I could eat ice cream 7 days a week, couldn&apos;t you? Hours: Open daily, call to confirm.